Play to be Great with Dunlop Picks! 12 Dunlop .88 Nylon Picks. Dunlop guitar picks are a top choice of today's pro musician! Dunlop's wide variety of gauges, shapes, sizes and materials allows the player to select the exact pick for his/her own particular style of playing. From classic country to nu-metal, every great player knows that their pick is an integral part of their tone, and Dunlop guitar picks are the picks that more pros rely on in the studio or on stage. Picks are a grossly underrated accessory. Don't sacrifice your tone...pick Dunlop guitar picks! 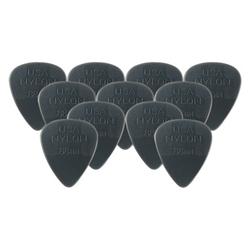 This package of light-gauge nylon guitar picks includes 12 gray picks. Dunlop Guitar Picks - The choice of the pros!